'Werewolves Versus' is a twice-yearly e-zine that pits werewolves against a variety of perils, including Music, Romance and The Eighties. 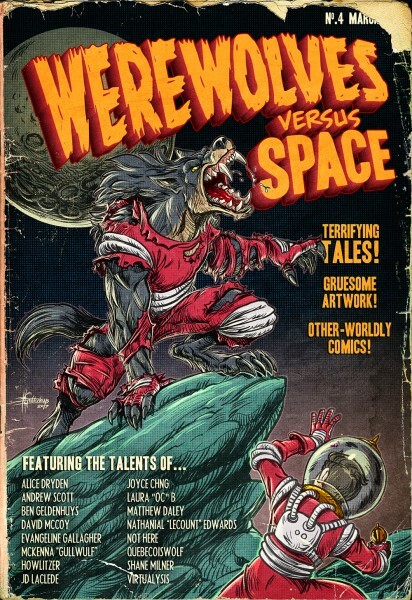 I'm really pleased to have a story in volume 4, 'Werewolves Versus Space'. Furthermore, it's a story about Soviet space dogs, a subject dear to my heart. Soviet space dogs. I love it. I love them. Even though they make me cry. Yes - thanks, Mum & Dad, for an alphabetically convenient name! Nerdy fact of the day: Don Adams (Max in Get Smart) was born Don Yarmy, but got fed up with having to wait when actors were being called in alphabetical order. I hadn't heard of Gumroad before, but they seem like a force for good. And the cover is amazing.